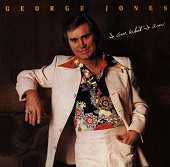 George Jones' comeback album, I Am What I Am, originally released in 1980, sounds like a man who never went away (which, he never really did in the first place). One of modern country's most heartfelt, lively-produced, breathing albums, I Am What I Am has the glossy production value of so-called 'modern country', while maintaining a pulse. "I've Aged Twenty Years In Five" feels as fresh as the morning sun, with Jones' sorrow-filled voice reminiscing on the past, and the rhythm section pulling it all together with a balanced beat that still manages to let loose. Than there is "Brother To The Blues," a song that will bring tears to your eyes with the sad slide guitar yanking down the tears, and the painful vocals trying to come to ease itself while desperately trying to comfort you, too. And how can we forget "If Drinkin' Don't Kill Me (Her Memory Will)," a soft, elegant country classic. "I'm The One She Missed Him With Today" possesses strong production values and a steady rhythm section with supple acoustic guitar and more of Jones' painfully knowledgeable, been-through it all vocals. Other album must-hears like "Bone Dry," "A Hard Act To Follow," and "It's All In My Mind," give you three more reasons to forget your troubles and invest in Jones'. Modern country, to me, is nothing more than Nashville Pop. If I want country music, I'll go listen to some Hank Williams and Marty Robins or some Tammy Wynette or Patsy Cline. Normally I'll avoid anything recorded later than the mid-70's, if not sooner. But Jones' I Am What I Am is just damn fine modern country. I'll give it an A.